Stanol-AQ 100 itself, especially in the injectable form, is not often used. The main reasons for hiding in not wanting to do frequent injections, the pricing policy of the recommended course and a weak effect. These main reasons for many newbies in the pursuit of quick effect are a negative factor. Like most non-experienced athletes, they mainly focus on quick effects, but unfortunately the quality of the results is not taken into account. 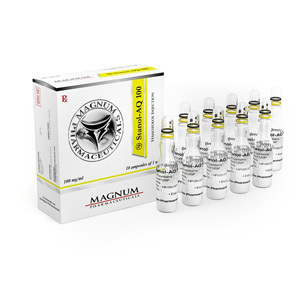 The use of Stanozolol injection is powerlifting, bodybuilding, and weight lifting. Since the first two directions are closer to us, let’s talk about them. In bodybuilding, stanozolol is used mainly at the preparatory stage for competitions. Since it does not cause the accumulation of water and in a protein-rich diet makes the muscles elastic and firm. The absence of any significant accumulation of water makes Stanol-AQ 100 an interesting drug for gaining high-quality muscle mass. However, due to the small androgenic component of stanozolol, rapid weight gain should not be expected. But what is typed is preserved mostly after its cancellation. In powerlifting, stanozolol is used mostly to improve power performance. At the same time, the increase in strength is more pronounced than the increase in muscle mass. That is why, if a power athlete ate it, you need to add strength and stay within your weight category, stanozolol fits perfectly. Powerlifting often uses combinations with methane, nandrolone, testosterone and turinabol. The stanozolol received the greatest reviews in conjunction with propionate, which allows you to build muscle mass and significantly increase strength. The combination allows you to get rid of excess fat deposits and remove water well, which allows you to make the muscles hard and relief. This effect may be obtained as a result of intensive training, reception without physical activity will not give the expected result. Often Stanol-AQ 100 and propionate are used by ordinary people in the spring to prepare their bodies for the beach season.